Mõned päevad on erilisemad kui teised! Hetkel mil oskad kõige vähem seda oodata võib saada tõeliselt südantsoojendava au osaliseks. Suurimad tänud oma erilistele klientidele kes kõige paremas mõttes suudavad „silmad ette anda“ oma tegemistes ja heades kommetes teistele. Suurimat edu neile! Some days are just greater than other days! In a moment when you can least expect it you will get part of such heart warming honor. Biggest thanks to so Special Campers who can show in best way being example to others in all what they do! 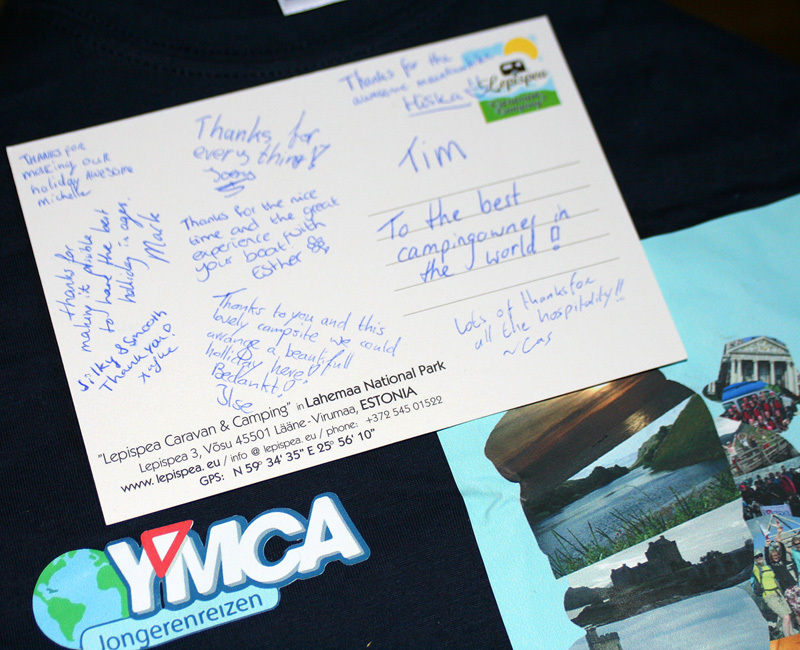 Biggest success to YMCA Jongerenreizen younger´s and their leaders! ﻿July 2013﻿ - :"Sehr schöner Platz, sehr hilfsbereite und nette Leitung, schöner Zuang zum Meer"
JanG/ august 2013 - :"We camped for four nights on the Lepispea campground in August 2013. This was after the high season in Estonia, which resulted in a very quiet campground, which added to the very positive experience. 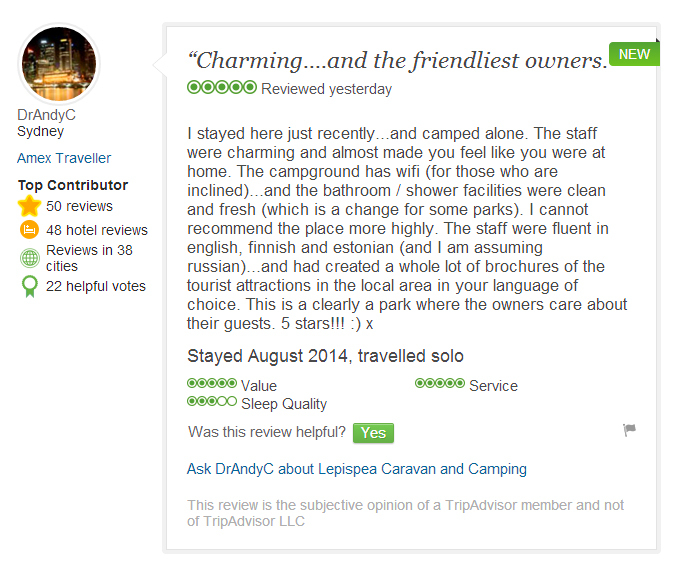 The showers and toilets are shared man-women, not overly luxurious, but good, with hot water and very clean. The campground has a fireplace and barbeque possibilities and there is a well equipped kitchen to be used by campers. But what really made this campground stand out during our Baltic trip was the sauna. It was all do-it-yourself, but heating up the fire and then enjoying the sauna with my wife and daughter was a great camping experience. But I could imagine that if you are earlier in the season and the camping is more crowded, it may be slightly less relaxed. Nevertheless, there is much to see and do in the national park and the lady of the campground was extremely friendly and helpful by doing trip suggestions and explaining which mushrooms to pick for dinner. Great value for money." June 2013 - :"Bijzonderheden: ruime plaatsen, uitzonderlijk vriendelijk en behulpzaam personeel, prachtige omgeving." Nick and Mary Jane from Australia (in june 2013) - ... : "So we headed to our accommodation – we had booked a few nights at a caravan park on the north coast in the Lahemaa National Park. The GPS couldn’t recognise the address – or maybe we just didn’t know how to enter Estonian addresses, but as we had the coordinates, we were able to use them to find the Park. The drive from the Border to Võsu took about two hours and included a road-side stop for some lunch, but the scenery was soooo pretty. Lots of pine and birch trees, well-maintained roads, even the road-side verges had been mown & whipper-snipped to within an inch of their lives! The villages that we drove through were clean and tidy, with the houses in well-maintained condition. The Estonians were really putting the Russians to shame! When we arrived at Lepispea, our Caravan Park, the manageress spoke very good English and was chuffed to have Australian guests – she told us that we were the first Australians who had stayed at the Caravan Park! She had information printed out in English about things to see in the area, walks in the National Park or Cycle paths – all in English!! Even the Caravan Park was a big improvement on the Russian parks we had seen (2) – more than one shower & toilet for the guests to use, staff who spoke English, information about activities or public transport. Yes, we had decided to stay there for 4 nights and we would catch the bus into Tallinn when we were ready to explore the capital. July 2012 - :" Ein toller Platz, gute Verkehrsanbindung - Busverbindung nach Tallinn - bester Platz an der Küste - Wir haben viele radtouren gemacht. Sehr schöne Umgebung - viele versteckte Badeplätze in der Nähe. Einkaufsmöglichkeiten im Ort - zwei Restaurants in der Nähe. Wir haben den Bus nach Tallinn genutzt ca. 10.- € / pP. Die Rezeption ist sehr hilfsbereit. Wir fahren bestimmt mal wieder hin. "